Dynomax Standard Universal Catalytic Converter In/Out: 2.5"
Walker Universal Catalytic Converters feature stainless steel bodies, heat-shielded pipes, and structural braces for enhanced strength and durability. 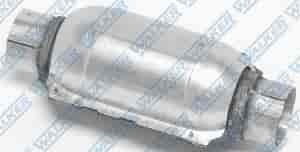 They adapt easily to custom applications with aluminized heat shields and expandable bushings. These converters provide good flow and OE looks, fit, and dependability all while cleaning up the air. Make the grade and reduce vehicle emissions by replacing your old catalytic converter with a new one from Walker. Note: Not legal for any state complying with California regulations. Super Converters flow much better than stock catalytic converters because their flow area is 26% greater than OE. These mono shell stainless steel units flow extremely free (great for engines up to 455 ci), and their single tube design eliminates all the welds common to OE for leakproof operation and greater efficiency. Note: Standard converters are recommended for pre-1995 applications. Ultra converters are recommended for vehicles 1996-Up. Does Dynomax 15053 fit your vehicle?